We’re celebrating the life made famous by Jimmy Buffett with Chef Carlo Sernaglia as he shares recipes from the new cookbook that perfectly captures the Margaritaville state of mind. We are so pleased to be welcoming Chef Carlo Sernaglia today to Living the Gourmet as he dishes on his newest release: Margaritaville: The Cookbook! As the title suggests, Chef Carlo delves deep into the lifestyle made famous Jimmy Buffett’s iconic song. Margaritaville conjures a vision of paradise and an invitation to kick back and enjoy good food with good friends. In the book, Chef Carlo shares his deep knowledge of Margaritaville’s signature dishes along with his wide-ranging culinary inspirations. 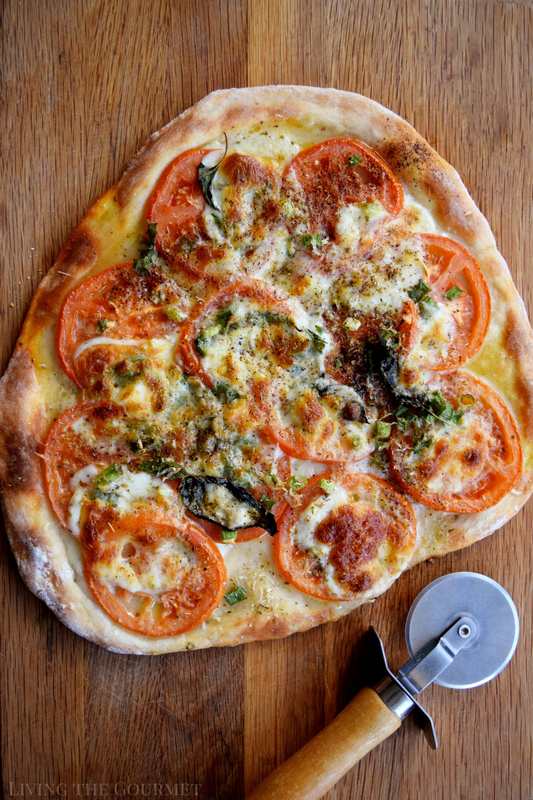 As we mentioned in our interview, one particular recipe that really stood out to us was the Pizza a la Minute! As Chef Carlo notes, this recipe is indeed the easiest and most practical dough you will ever come across, so be sure to keep this yeast-free, instant recipe on hand. In a large bowl, combine ingredients for the dough. Once the yogurt has been absorbed, knead the dough with your hands. The dough will be sticky. Transfer over to a well-floured surface and knead until smooth and no longer sticks to your hands, about 5 minutes. Note: Add as much flour as you need to make the dough nice and soft; it may take another cup all together). At this point you can use the dough immediately, or wrap in cling film and keep in the refrigerator for up to 2 days. Divide the dough in half and shape into a round disc. Use a well-floured rolling pin to shape each disc into a thin round. Carefully transfer the prepared doughs onto a pizza stone or pizza pan. Blind bake the doughs for about 3-4 minutes. Fix each pie with your desired toppings (except the basil or it will burn), and return to the oven. If you’re using a preheated pizza stone, it will only take about 8-10 minutes to cook, if you are using a pizza pan it may take a little longer. Bake the pies until they are golden around the edges and bubbling. Sprinkle with fresh basil and cut into wedges. Serve and enjoy! Thank you so much, Chef Carlo for stopping by Living the Gourmet today. 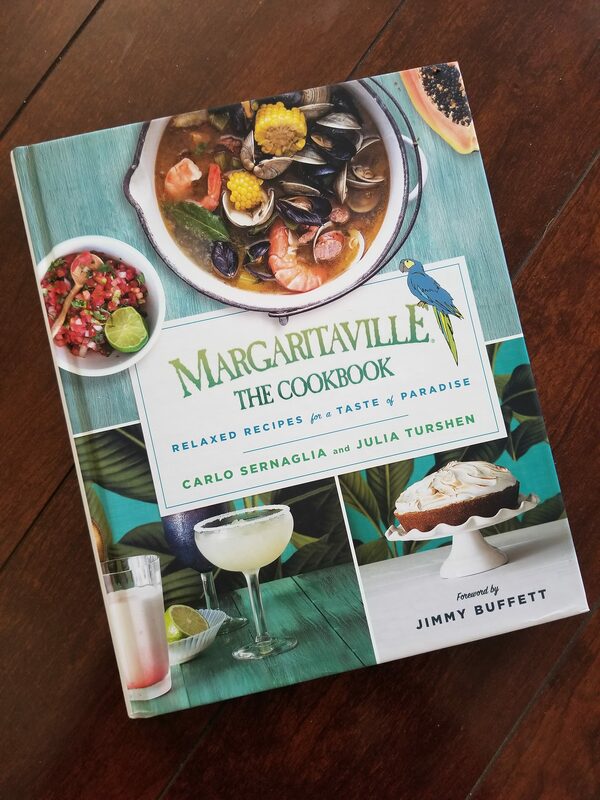 Be sure to get your copy of Margaritaville: The Cookbook this season (it also makes a great gift for Mother’s Day and Father’s Day)! That is such a cheesy and delicious pizza. 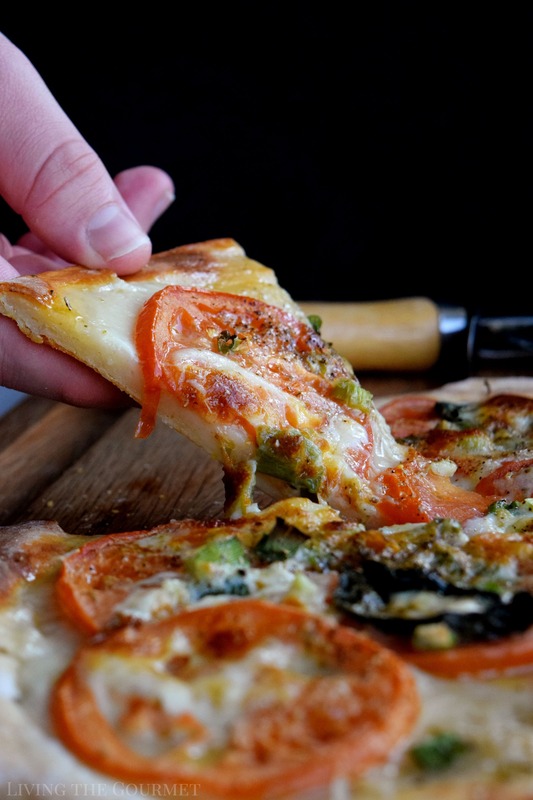 Love the quick dough with yogurt - will have to try your pizza dough some time soon. Do you think whole wheat flour would work here? Thank you. I love Jimmy Buffett, this cookbook is so up my alley! I can't wait to give this pizza a go, it sounds so tasty! 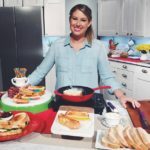 I am all for quick easy recipes, especially if its pizza! But where can i buy Italian flour? thanks! We make pounds of pizza dough every month. We've never made it without yeast -- an interesting recipe we'll have to try. We do like our pizzas on the plain side. The way you've made it is perfect. This looks crazy good! I love that you added romano cheese .. it's one of my favorites and I think it adds so much great flavor. I can't wait to make this!